Expert tip: This is one of the most popular yoga retreats offered in Morocco. Dfrost Almugar Surf & Yoga Villa invites you to join this unforgettable surf and yoga retreat and take your holiday directly to the ocean! Wake up with the sound of the waves, get energized with sunrise yoga classes on a rooftop terrace, and enjoy amazing surf practices through the day. From wonderful and energizing yoga practices, delicious meals, to relaxing time to chill by the beautiful ocean terrace, this retreat has it all! The famous Surf & Yoga Villa is located directly on the ocean’s shore. Built in a traditional Spanish/Moroccan style, it exudes warm and welcoming vibes with a spacious and comfortable dining and living area that opens out directly onto our stunning ocean view terrace. You can enjoy the view from the terrace in the hot tub with a cold beer after an amazing surf session. Our open air yoga shala is on the rooftop with incredible sunrise and sunset views. Our shared standard rooms accommodate 4 guests with shared bathrooms, fresh, clean bed linens and towels and lockers for your important belongings. We have a twin/double rooms which can be booked as a private or shared twin/double or 4-bed rooms. These 4-bed rooms can be shared with other guest bookings, ideal for solo travellers looking to make friends. The majority of our budget rooms are right next door in the shared Surf House apartments with full access to all our main Surf House facilities. Beautifully decorated with breathtaking ocean views, the rooms include bed linens, towels and wifi access with shared living room, kitchen, ocean front balcony, terrace and bathrooms. Our Standard plus rooms are a mix of double/twin and triple rooms with shared bathrooms. Each morning you will wake up to a beautiful sunrise as all standard rooms have a magnificent ocean view balcony. Each balcony is equipped with a table and two chairs for enjoying your breakfast, lunch, or just a drink. The comfortable rooms are decorated with traditional Moroccan furnishings and vibrant textiles to make it feel like home! Rooms include fresh linens and towels, a bottle of water on arrival, storage for clothing, wifi, and bluetooth speaker, and an ocean view from your bed. Bathrooms are shared on each floor. Enjoy two daily 60 minute yoga classes, vinyasa and restorative/yin style on our beautiful rooftop yoga shala overlooking the Atlantic Ocean and open to the skies. Our 7am sunrise class takes more of a vinyasa flow style, preparing and energising you for your day, whether it’s on the water or in the hot tub. The sunset class at 5.30pm has a restorative style especially designed with tired surfers in mind! We use props to help you stretch out sore shoulders, and tight hips and hamstrings - souvenirs of your surf, or your desk job. No matter what level of experience you have, our lessons are designed so that you can move at your own pace, with more and less advanced modifications offered throughout. Let our qualified instructor help you to increase circulation, release tension, improve your balance, and connect you to the joy of life in movement. Yoga and surfing go hand in hand; they are both more than a sport, they are ways of life. These practices help you connect more fully to the present moment and ride the wave of life. Yoga helps you develop strength and flexibility on the board and wind down after a great day in the water, or on the beach. Rejuvenate your spirit, strengthen your connection to the ocean and feel centred in your body after a great class. Our surf school has been running since 2008, working with hundreds of surfers, ranging from first timers to advanced surfers seeking those big breaks. The philosophy we live by is "the best surfer is the one having the most fun". Our team of qualified surf instructors are on hand to make sure that you have the best surf experience possible during your stay. Guests are divided into groups according to skills level and experience. Our team of expert surfers use their local knowledge of the nearby spots and the swell conditions and safari to find you the best waves to make sure you’re making the absolute most of your holiday. Once you’ve found the perfect spot for waves, you’ll have a 2 hour surf lesson, including safety information, warm ups and in and out of the water guiding and tips, and most importantly, fun. After a well earned break for lunch you’re free to polish your new surf skills on your own, under the watchful eyes of your instructors. Our Surf Safari usually leaves the House at 9am and returns around 4pm, however according to the swell conditions and the surf level we also run early morning and sunset sessions. Daily surf safari to search for the perfect waves is included in this retreat. 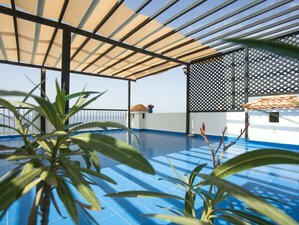 The Dfrost Almugar Surf & Yoga House is located in the small fishing village Taghazout, 19 km north of Agadir in the south west of Morocco. Taghazout is the closest place for any European surfer to get all-year-round warm water, perfect waves, and a unique cultural experience. The Surf House in Taghazout is situated right at the beach overlooking the famous surf spot Hash Point, you can walk out of the back door and straight into the water. Anchors Point (the most famous spot of Morocco) and Panoramas can be seen directly from the ocean view terraces. With views of the Atlantic Ocean to the west and beautiful hills and mountains to be enjoyed to the East, Taghazout is perfectly located for a beautiful, varied and relaxing holiday. We provide you with delicious daily breakfasts, and everything you need to pack yourself a hearty and tasty lunch for the beach. Six evening meals are included, our famous Sunday BBQ being the highlight! And you can help yourself to fresh local fruits throughout the day. Food is very important to us at the Surf House, we’ve spent many hours creating the right balance between the Moroccan and European kitchen with hungry surfers in mind. A delicious vegetarian alternative is always provided. All meals are fresh and lovingly prepared daily on site by our talented kitchen staff. The buffet- style breakfast is served every day at the dining room in the main house from 07:30 to 09:00. The breakfast offers classic food like bread, marmalade, chocolate spread, the famous Moroccan amlou (delicious almond, argan oil and honey nut butter) cheese, grilled vegetables, home-made pestos, and daily different options like crepes, cakes, fruit salads, Moroccan eggs, and much more.The breakfast gives you many options to create a lovely picnic for the beach. Lunch will consist of self-packed sandwich. Every evening (except Fridays), you will be provided with delicious home-cooked dinners. You will be served a mixture of traditional Moroccan dishes like tajine and couscous and European favourites, always with a vegetarian option. On Sunday evenings, we serve our famous buffet-style, Sunday barbecue. After a long day in the surf, we know you need to refuel! We serve a Moroccan soup for starters, all meals are accompanied by salad and on at least three evenings a week a dessert and Moroccan mint tea. We also have a bar, fully stocked with local and imported beer, wines and spirits, soft drinks and snacks open from 4pm. So you can enjoy a post surf beer in the hot tub, or a lovely glass of Moroccan wine with dinner. Dfrost Almugar Surf House provide professional excursions via their child company Allegra Tours which has several comfortable four-wheel drive vans with air conditioning. The excursions are professionally organized and led by multilingual guides, just speak to your Hosts when you’re with us and they can arrange your trips. Other activities include day trips to Marrakech, Essaouira, or Paradise Valley, chill out by the beach, ride camels and horses on the beach, dine in the nearby restaurants, enjoy the ocean view from the terrace with a drink, explore the nearby surf spots and mountains, relax in the hot tub, or watch movies on our the big indoor cinema screen. Our nearest airport is Agadir-Al Massira Airport (AGA), we will pick you up from Agadir Airport for free. Alternatively, book your flight to arrive at Marrakech Menara Airport (RAK). From mid-May/June/July, Dfrost Almugar Surf House & Yoga Morocco is offering free pick ups for our guests at no extra cost. This service is a collective pick up and available on every Tuesday/Thursday/Saturday. The car will leave Marrakech airport at 20:00 in the evening. Every Tuesday/Thursday/Saturday, Dfrost Almugar Surf House & Yoga Morocco will also drive up to Marrakech airport between 7-8:00 am in the morning. If you travel by bus to Agadir, it is recommended to take a taxi from the Marrakech Menara Airport (RAK) to the bus station with CTM or Supratours. Buy your ticket and inform our Hosts of your expected arrival time in Agadir bus station. We will then schedule the pick up from the bus station for you. Once you arrive in Agadir, the driver will be waiting for you next to the bus. You can recognize him by a "Dfrost" sign in his hands. Taking the bus with CTM or Supratours is perfectly safe for female/solo travellers. Airport: Agadir–Al Massira Airport Airport transfer included: Agadir–Al Massira Airport No additional charges. You can request this in the next step. Airport: Marrakesh Menara Airport Airport transfer available: Marrakesh Menara Airport (US$133 per person) Additional charges may apply. You can request this in the next step. Dfrost Almugar a Moroccan & European led company leader for Yoga & Mediation AND Surf Yoga retreats in a stylish, warm and relaxing environment. Arrive in mid-May, June, or July and get free airport pick-ups from Marrakesh Menara Airport! For more information, check “How to get there” section or send an inquiry!